CLASSIC FORD MUSTANG. 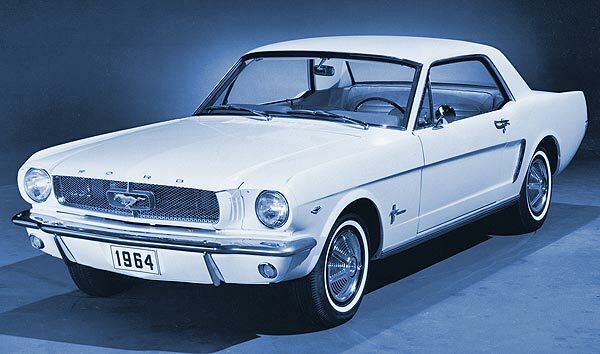 The first Ford Mustang the automarket and industry knew was launched in the year of 1964. The production of this compact car started in 1964 in Michigan. It was based in the second generation of the Ford Falcon car and was introduced to the market in April of 1965 and sold for under $3000 dollars. More than one million of Ford Mustangs were manufactured in its first year. Its name came from the P-51 Mustang fighter plane. This name was suggested by the executive stylist John Najjar. Currently, the Ford Company started the production of its fifth generation in 2004 for the 2005 model. The Ford Mustang created a new class in the automotive market: the Pony Car, an affordable, highly styled and compact car with a sporty oriented image, entering strongly to compete with the Chevrolet Camaro and the Plymouth Barracuda. The Ford Mustang also was an inspiration in the creation of the Toyota Celica and the Ford Capri. For the forth Mustang generation (from 1994 to 2004), the Ford Company introduced the well known Ford Mustang models, GT (2001) and Supercharged Cobra (2003). The new Ford Mustang, with a price that ranges between $20,000 and $30,000 dollars, is available in 8 different trim models, divided in the V6 Coupe (V6 Coupe, V6 Premium Coupe, V6 Convertible and V6 Premium Convertible) and the GT Premium Convertible (GT Coupe, GT Premium Coupe, GT Convertible and GT Premium Convertible). The Ford Mustang V6 Coupe is built with a standard 4.0-liter, V6 and a 210 horsepower engine which gets up to 18 mpg in the city and 26 mpg on the highway. The GT Premium Convertible comes with a standard 4.6 liter V8 engine of 315 horsepower which gets up to 16 mpg in the city and 24 mpg on the highway. The Mustang I prototype, was released on October 7, of 1962, in Watkins Glen track in New York. 22,000 Mustangs were sold on the first day of its launching. In the next 2 years Ford Motor sold over one million more. The first Mustang was mistakenly sold to an airplane pilot. The automotive industry didn't know any 2002 model edition of the Mustang Cobra. Phil Clark, a Senior Designer and the artist behind the Ford Mustang, is the original designer of the galloping horse logo. The Mustang II launched in 1974, sold 3 times the quantity of Mustangs sold in 1973. More information about the new Ford Mustang at the Official Site.